In today’s global business environment, lawyers have had to evolve and adapt their services and skills to enable their business clients to accomplish their aims. Lawyers with knowledge and experience of managing cross-border transactions are highly valued by their clients for helping to clear the path and get sophisticated and complex deals closed. But often, when matters do not go as planned, businesses have to contend with a raft of new challenges. Aside from traditional litigation, arbitration has been increasingly adopted as an effective means of resolving international commercial disputes. As a result, opportunities for international arbitration lawyers are on the rise. A survey conducted in 2010 by Queen Mary, University of London and sponsored by White & Case LLP: ‘Choices in International Arbitration’ – reveals that 40% of the corporations use English law as the governing law of cross-border transactions, followed by 17% who use New York law. The perceived neutrality, impartiality and the appropriateness of the English law have been indicated as extremely important factors in the choice of governing law. Moreover, London was referred to as the most preferred and widely used seat of arbitration or litigation, with a reputation for a fair, efficient and impartial judiciary. The two leading arbitration centres globally, by caseload and preference, are London Centre for International Arbitration (LCIA) and ICC International Court of Arbitration (ICC), based in London and Paris, respectively. The lesson for ambitious dispute resolution lawyers is clear: London leads the world in arbitration work. As the most popular choice of law for cross-border commercial agreements, knowledge and experience of English law is a key component of establishing yourself as an international arbitration lawyer. The QLTS scheme unlocks the opportunity for lawyers just like you to become an English solicitor in just a few months through a fast-track route for qualification, without undergoing an internship, traditional training contract or fulfilling any experience requirement. 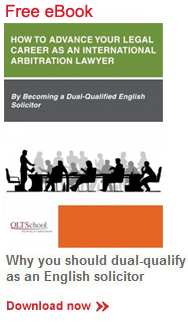 Hence, becoming a dual-qualified English solicitor via the QLTS will provide you with many of the key tools for building a career in international arbitration and dispute resolution.